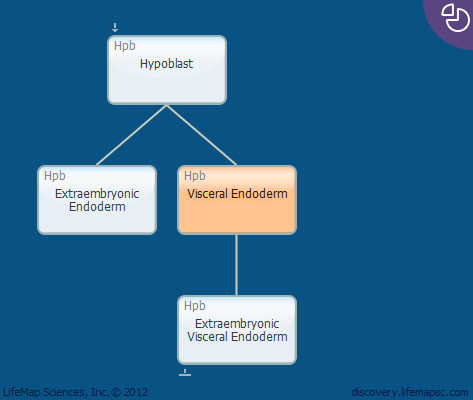 The visceral endoderm develops in the murine embryo from the hypoblast and is an extraembryonic tissue that envelops the epiblast before gastrulation. The later extraembryonic visceral endoderm layer overlays the extraembryonic ectoderm. The cells of the visceral endoderm are flat squamous cells featuring microvilli. The visceral endoderm layer functions in a regulatory capacity but is generally considered an extraembryonic structure that does not contribute directly to the formation of any adult organs. However, recent findings suggest that there is a certain contribution of visceral endoderm cells to the endoderm and gut lining of the embryo proper. The above description pertains to yolk sac formation in murine development. The equivalent in humans is the yolk sac endoderm. In mouse development, the parietal yolk sac is a transient structure that is replaced by the visceral endoderm, whereas in human yolk sac development, the transient primitive yolk sac structure is replaced by the definitive yolk sac. Visceral endoderm cells can be detected as late as the 16–18 somite stage in the lining of the gut, indicating that these cells do contribute to the embryo proper. Visceral endoderm cells can be detected as late as the 16–18 somite stage in the lining of the gut, indicating that these cells do contribute to the embryo proper.